A decade ago hardly anyone knew what a “Dreamer” was. Fast-forward to the present and this group of youthful, undocumented activists is everywhere—making headlines in the New York Times, marching in the streets of Phoenix, and even staging a very public response to President Obama’s State of the Union address dubbed the “State of the Dream.” Simply put, the Dreamer movement has arrived. Or rather, they’ve always been here—living in the shadows—but only just recently “come out” and claimed a starring role in the stage of American politics. One of the strongest voices is that of United We Dream (UWD), the largest immigrant youth-led network in the country. It all started back in 2002, when a little-known piece of legislation called the Development, Relief and Education for Alien Minors (DREAM) Act, was introduced in the Senate. The bill failed to make it further than a subcommittee, but it galvanized the underground subculture of students and young people who were brought to the U.S. by their parents as young children without documents. UWD became official in 2008, with the National Immigration Law Center (NILC), a non-profit 501(c)(3) organization, serving as its fiscal sponsor. Founded in 1979 and based in Los Angeles, NILC describes itself as “the only national legal advocacy organization in the U.S. exclusively dedicated to defending and advancing the rights of low-income immigrants and their families.” UWD is headquartered in Washington, D.C with a full-time staff as well as paid consultants and volunteers. The organization is comprised of 52 affiliate groups in 25 states made up of Dreamers, organizers, and advocates who are working in their local communities, as well as a National Coordinating Committee. UWD’s board members come from the affiliates, such as Chair Sofia Campos, from Dream Team Los Angeles, and treasurer Mayra Hidalgo Salazar, from the Florida Immigrant Coalition. In total, UWD claims over 20,000 active members. According to Development Director Alejandra Ruiz, the group does not receive direct financial support from NILC. But it is supported by grants from Unbound Philanthropy, the Ford Foundation, Open Society Foundations, and other groups such as the National Ediucation Association (NEA), which has lobbied forcefully for the DREAM Act. A native of Quito, Cristina came to the U.S. with her family at the age of 13, attending high school and college as an undocumented student. Despite her youth, she is a seasoned community organizer who has mobilized immigrant youth and workers in support of pro-immigrant legislation at the local and national level since 2004. She co-founded the New York State Youth Leadership Council and was a policy analyst for the Drum Major Institute for Public Policy before starting UWD. Recently she was recognized as one of five non-profit leaders who will influence public policy in 2013 by the Chronicle of Philanthropy. By providing nonprofit governance and online activism strategies, the organization has strengthened its coalition and created a new generation of media-savvy activists that draw strength from developing innovative and bold grassroots strategies and protest tactics to achieve their political goals. 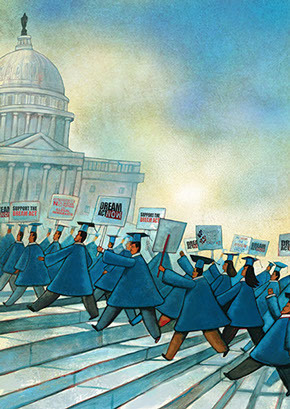 On occasion, however, the very strategies Dreamers are known for, such as occupying offices of leading politicians, both Democrat and Republican, often in their trademark blue graduation gowns, and aggressively lobbying Obama Administration officials such as Cecilia Muñoz, have put them in conflict with more mainstream Latino groups. NIYA made waves as well as headlines last July when three undocumented activists affiliated with it traveled to Mexico and returned to the U.S. through a legal port of entry, declaring their immigration status in protest to the Obama Administration’s record pace of deportations. Becoming known as the DREAM 9 when they were joined by six others on the Mexican side of the border, they were arresed and released within a month. But these in-your-face tactics created a rift with Congressman Luis Gutierrez, who claimed the group had secretly recorded his conversations with the parents of detained immigrants. “The Office of Congressman Luis Gutierrez will no longer work with the NIYA and their affiliated advocates at DREAMActivist.org,” Gutierrez spokesman Douglas Rivlin said in a press release. Another Washington, DC-based organization is the DREAM Action Coalition (DRM), which was “created to become a focused political and lobbying voice in our movement.” The group’s co-founder, Erika Andiola, is a former Congressional staffer for Arizona Congresswoman Kyrsten Sinema who started her community organizing experience with the Arizona Dream Act Coalition. Last year, Andiola watched as immigration agents handcuffed and took away her mother and adult brother from their Phoenix home--arrests that sparked swift outrage across the nation. Both were released after Federal officials were bombarded with petitions and calls. On February 26, Andiola and two others were arrested as police cleared out protesters camped outside U.S. Immigration and Customs Enforcement headquarters in Phoenix. They were among a group of six fasting since Feb. 22, as they seek the release of family members held at an ICE detention facility in Arizona, KTVK-TV reported. The three were arrested for violating an anti-urban camping ordinance. As this issue of LATINO goes to press, Andiola is still being held by Maricopa County Sheriff Joe Arpaio. Janet Murguia, President and CEO of the National Council of La Raza (NCLR), says Dreamers have helped put a face on the immigration issue. “They have embodied the issue to the extent that people now realize we are talking about human beings with the same dreams, hopes, and aspirations as everyone else, not some abstract ‘mob,’” she said. Yet Dreamers created friction with NCLR by heckling President Obama as he spoke at the annual NCLR convention in Washington, DC. Wearing t-shirts that read “Obama Deports Dreamers,” twenty activists attempted to disrupt the event. “We stood up while President Obama gave another of his predictable speeches on immigration becase we are outraged at his trying to promote his election among Latinos while continuing to deport us at a time when thre is no legislative solution to the immigratrion crisis,” said Felipe Matos, an undocumented student from Florida.. Continuing in that vein of defiance, United We Dream staged the first ever “State of the Dream” earlier this year on the heels of President Obama’s State of the Union speech in Washington D.C. Over 100 Dreamers and their families attended the address and descended on Capitol Hill to pressure Congress and President Obama for immediate relief and a permanent solution to the broken immigration system, including to keep families together, halt deportations, and pass legislation that affirms the dignity and hard work of the undocumented community. During the State of the Dream, the activists vowed to hold President Obama accountable for what they say is an “appalling” figure of almost 2 million people deported, and countless families separated, more than all other presidents combined. For her part, Jimenez emphasizes that it is in the best interest of both parties to provide a solution on immigration this year because of the presidential election in 2016. In particular, she argues that if the GOP keeps up the anti-immigrant rhetoric, it could face the danger of being shut out in national elections. She doesn’t let Democrats off the hook either. While it seems unlikely that immigration reform, or even the DREAM Act itself, will prevail in the current congressional session, one thing is for certain—the movement of immigrant youth and the overall immigrant rights movement is stronger and more powerful than ever. The undocumented youth of this movement also arguably present the most sympathetic case for immigration reform and count on a great amount of public support. If recent developments are a sign of things to come, then UWD must be doing something right. A bipartisan group of wealthy business executives, including former Washington Post owner Donald Graham, philanthropist Henry Muñoz III and former Commerce Secretary Carlos Gutierrez, came together in February to announce the launch of TheDream.US, a new $25 million National Scholarship Fund for Dreamers. “The recent announcement by TheDream.US to provide scholarships for Dreamers to attend college is an enormous step forward and will provide the opportunity for so many talented, young Latinos who want to contribute in this country to achieve their goals and pursue the American dream,” said Esther Aguilera, President and CEO of the Congressional Hispanic Caucus Institute (CHCI). For Garibay, who finally received permanent residency status after 20 years and can now begin legally pursuing her career (she has a degree in nursing), it’s a bittersweet moment. She’s decided to put the one thing she’s always wanted to do for so long on hold until the same comes true for all Dreamers.